The Car Wash Guys and Detail Guys of Palm Desert, California are really serious about servicing their market and they understand what it takes to attack such a positively charged demographic area. It takes a special array of urban assault vehicles to handle these high end neighborhoods. 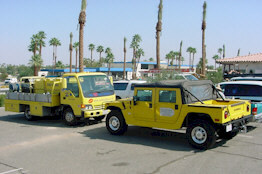 The Car Wash Guys have decided that the only way to properly service the customers is with an Hummer. And of course it is bright yellow. Our franchisee in the area has purchased the franchise from Stan Mattes. Our new franchisee has hired back Stan to work as Operations Manager. What a great team. They are nearly finished with their new facility. 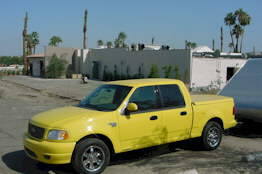 As many of you know this Ford Pick-up with be used as part of the new "Grid Defense Plan." Part of this new marketing strategy included many proto-type drawings such as this one done by a franchisee in Houston in early 2002. WashGuys believe in making a statement, this newest residential service vehicle will be used in Detailing Cars and servicing residential washes of high end cars and toys in the Valley.